Bu bölümde öğrenciler anlayamadıkları bölümleri daha iyi kavrayabilmek için kılavuz niteliğinde hazırlanmıştır. Konuyu daha iyi kavrayabilmek için buradan öğrendiklerinizle kendinizde çözmeye farklı örnekler yapmaya çalışınız. Öğrenci cevaplarını birebir kopyalamayınız. Buradaki 8. sınıf ingilizce adventures ders kitabı cevapları ve çözümleri sizin için derslerinize büyük katkı sağlayacak eksiklerinizi giderebileceksiniz. # 1. Match the phrases with the photos. Listen and check, then say. # 2. Match the words with their meanings. Then use your dictionary to check the answers. # 3. What do you think about extreme activities? Share your ideas, as in the examples. # 4. Compare the extreme activities below using the words in parantheses, as in the example. # 5. What activities do you prefer? Why? Work in groups of four and complete the table. Use the sentences in the box below to help you. Then report it in class. # 1. Look at the postcards. Where is each person? Match the photos with the people. # 2. 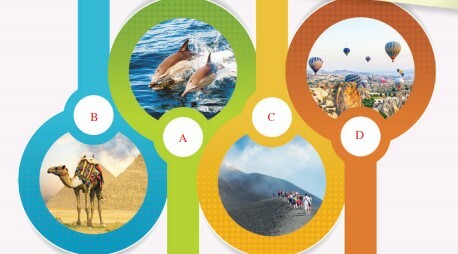 Listen and read the postcards and choose a, b, c or d to complete each statement. 1) Paul’s dream was to swim with dolphins. 2) Lisa thinks riding a camel was a fascinating adventure. 3) Tony won’t forget the thrilling climbing. 4) Maria thinks flying over in a hot air balloon is exciting. # 3. Read the texts again and complete the table. # 4. Whose adventure do you think is the most exciting? Write a few sentences and tell the class. # 5. Imagine you are on holiday. Write a postcard to your English pen-friend about your adventures. # 1. What’s the difference between cycling and mountain biking? Share your ideas. # 2. Listen to the discussion and find the topic. Choose from the options. # 3. Listen again. Write T (true) or F (false). # 4. Are you an ‘adrenalin junkie’? Why/Why not? Share your opinions in class. # 1. Match the words. # 2. Complete the sentences with four of the phrases above. 1) I’d like to try swimming with dolphins, but unfortunately, I can’t swim well. 4) I’m afraid of height, so I can’t try bungee jumping. # 3. Complete the dialogue with the sentences a-e in the box.